I am the Daddy to two beautiful, healthy girls. We live in the luckiest country in the World. We have clean, fresh food available at the nearest shops. 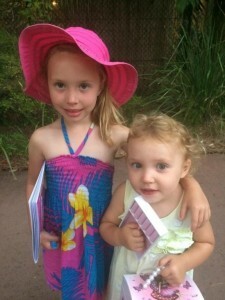 Both my girls can go to school and get an education, free from fear and persecution. And when they are thirsty, they can turn on a tap and get clean, fresh, safe drinking water, 24 hours a day, everyday. They do not have to walk for 3 hours everyday to collect water for their family, like millions of little girls do all around the World ( girls are often taken out of school to collect food and water, while boys are left in school to be educated). Everyday, it is estimated by the World Health Organisation that over 6000 children die from dirty, unsafe water. EVERY DAY. That is 2.5 times the passenger capacity of the Titanic. Every single day. Or the equivalent of the MCG every two weeks. No matter how you look at it, it is horrifying. In this day and age, with all the things Mankind has solved, created, invented, overcome, discovered or experienced, we cannot and should not tolerate such terrible statistics. The thing is, we can do something about it. In partnership with The Water Project (thewaterproject.org), we can all work together and raise enough money to place, for example, a permanent deep water well in a village in Africa. As a dad, I find it very difficult to know there are children all around the World who do not share the basic life necessities that my children take for granted. I find it harder, the older I get, to look at myself in the mirror, knowing how lucky we are and how terribly unlucky so many others are. Why can't we all be lucky? Alone, I can't do much. I need help. I need YOUR help. Please. I have a goal, to raise $10,000. Together, we can do this. For the price of a bottle of fresh, clean, water or a coffee, we can all give and make a difference. Actually, we can make THE difference. To a village. They say it takes a village to raise a child. Maybe it takes a nation to raise a village. Let's find out. 03/23/14 Karen Schurmann $23.00 Fantastic worthwhile project! 03/08/14 Anita C $10.00 Looking forward to donating more each month. What a brilliant cause. 03/08/14 Anonymous $5.00 I'll drink to that!